In this article I explore several plot wheels and examine how they can be used to generate ideas during NaNoWriMo (or anytime!). But, first, some background. "An amusing sidelight: the century’s greatest supporter of Developing the Plot may have been Edgar Wallace, a bestselling potboiler novelist of the 1920s. Wallace invented—and patented—a device called the Edgar Wallace Plot Wheel. When you got stuck for the next Plot Development or needed an Amazing Turn of Events in a hurry, you simply spun the Plot Wheel and read what came up in the window: a fortuitous arrival, perhaps, or Heroine declares her love. These gadgets apparently sold like hotcakes." "You may wonder where plot is in all this. The answer—my answer, anyway—is nowhere. I won’t try to convince you that I’ve never plotted any more than I’d try to convince you that I’ve never told a lie, but I do both as infrequently as possible." Stephen King is a well-known pantser (or, if you prefer, a discovery writer). He doesn't plot. He crafts realistic characters and then sets them lose on an unsuspecting story world; or perhaps it's the other way around. He creates realistic characters, characters we identify with, and then places them in a world, one much like our own, but with sharper edges. "I want you to understand that my basic belief about the making of stories is that they pretty much make themselves. The job of the writer is to give them a place to grow (and to transcribe them, of course). (On Writing)"
I'm going to argue that, even if one holds the above view, there's still a place for plot wheels. Not for generating plot, but for generating ideas. It's sort of like watching clouds on a warm summer day. You're lying in the grass, the warmth of the sun baking into your skin, the hard, cool, earth at your back. You're absently chewing a piece of grass and looking up at the clouds, watching them transform into all manner of things. A bear, a mountain, a heart, a rose. Anything. My point: we get ideas in all sorts of ways. Why not plot wheels? During NaNoWriMo anything that can help you generate ideas is a good thing. "Key to Gardner's remarkable output was his use of the plot wheels invented and patented by another of his successors, a British crime novelist named Edgar Wallace. By using different combinations of possible twists and turns for both major and minor characters, Gardner was able to construct narratives that held his readers rapt for several decades." I've taken the liberty of transcribing four of Edgar Wallace's plot wheels. These folks put obstacles in the hero's way, make it difficult for her to reach her goal. 1. Hero is betrayed to villain by spies. 2. Every move the hero makes takes him from the frying pan and puts him into the fire. 3. Heroine's maid is a spy. 4. Father of heroine is hostile to the hero. 5. Detective believes the hero is guilty and tries to arrest him/her at a critical time. 6. Hero commits an incidental crime. For example, he/she is caught speeding and is arrested. 7. Witness mistakes hero for villain. 8. Hero violates the law and is sought. 9. Heroine's mind is poisoned against the hero. 10. Some character is not as represented. 11. Rival in love tries to discredit the hero. 12. Zeal of hick cop upsets plans. 2. A document is forged. 3. A witness is planted. 4. A client conceals something. 5. A client misrepresents something. 6. A friend pretends to betray the hero. 7. The villains assistant pretends to betray the hero. 8. A vital witness refuses to talk. 11. A witness takes flight. 12. A witness is kidnapped. 13. A witness commits suicide. 14. A witness sells out. How the hero surmounts the obstacles thrown in his way. 1. Gets villain to betray himself through greed. 2. Gets the villain to, of his own free will, plant additional evidence. 3. Plants fake evidence to confuse the villain. 4. Fakes circumstances so the villain will think he/she has been discovered. 5. Tricks the hero's accomplice into confessing. 6. Villain is hoist by his/her own petard. 7. Villain killed while he/she is trying to frame someone. 8. Gets villain to overreach himself/herself. 9. Meets trickery with horse-sense. 10. Squashes obstacles by sheer courage. 11. Turns villains against each other. 12. Traps [tricks?] villain into betraying a hiding place. Hero either a) creates a fake fire, or b) gives him/her something else to conceal, or c) makes it necessary for the villain to flee (and so must take something out of the hiding place). This idea can be adapted to any area. I think I'm going to put together a list of professions as well as a list of things a character could plausibly lose. I've had fun writing about plot wheels. I hope they'll provide an idea, or three, for you just when you need it whether or not you're going through NaNoWriMo. Here's an app, The Brainstormer, that does something similar to a plot wheel. I haven't used it, but it looks interesting. Note: My next post will be about Dan Wells' 7-Point System. 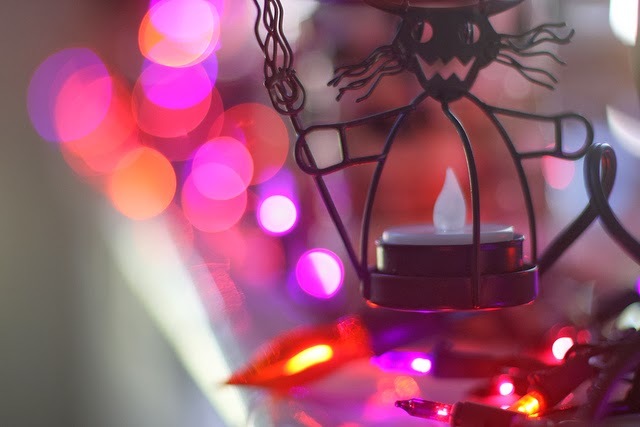 Photo credit: "Every holiday brings new bokeh" by kevin dooley under Creative Commons Attribution 2.0. That would be great, wouldn't it. Many times I've wished I could run an iPad app on my laptop. Some companies do have different versions. I'd say your best bet is to go to the developers website. Thanks Kim! And thank you for sending me the link. Good stuff. Hi Karen, thanks for sharing this article I really enjoyed reading it. The timing is excellent for me, and I shall be bookmarking it, as I'm researching how to write "pulp fiction" both as a craft-lesson and a way to provide some rich content for my fantasy world. Have you come across Lester Dent before? (he wrote the Doc Savage series in the 1930's) He wrote each of his stories to an exact formula, by all accounts (and my research) each one sold very well. Additionally you may be interested in the following link that demonstrates how someone took his formula and used it to create a generator for role playing games - I'm using it as a basis for my own plot wheel! Thanks once again for sharing this article and expanding on my knowledge of pulp fiction. (Blinks) Wow! Those are great articles, thanks for passing them along. I have indeed heard of Lester Dent, I even have a few of his books, though he wrote under pen names. I've also heard of his formula--I want to try it out one day. Would love to read one of his short stories but I haven't been able to find one, just his novellas and novels. As for the plot wheel--it's not a wheel, but that's the idea--you sent me a link to ... again, wow! It's fabulous. I try and complete Chuck Wendig's flash fiction challenges, one a week, I'm going to have fun trying that out. Steve, thanks a million for passing those links along and for your comment. Good stuff. I tried your second link, twice, and got the following, "The file you requested is not valid." Has it been removed since your posting? Hi Rick! Thanks for your comment. I've tried all the links in this article and they _seem_ to be okay (but they are devious, so one can't be absolutely certain). Could you tell me the name of the link that's sending you off on a wild goose chase? Thanks! I'm Writing A Book On Writing. Here's Why.